Toymaker Blip Toys are recalling 15,000 Nature Wonders HD Pinto Horse toys due to high levels of lead paint. The Minneapolis toy company sold the toy horses from January to July of 2009 for $4 each in Walmart stores nation wide. The horses in the recall are white with brown spots, and stand 4 inches tall. Model number 92093 was printed on a retail tag and found around the toy’s back leg. The tag also included the name of the horse and Blip Toys. No injuries have been reported yet, however they Pinto Horses were found to have excessive levels of lead in the surface paint. The levels found on the horses was far higher than considered safe by federal standards. The toys were manufactured and shipped to the U.S. from China. This comes two years after the massive Chinese toy recall in 2007 where many toys were found to have dangerous levels of lead. 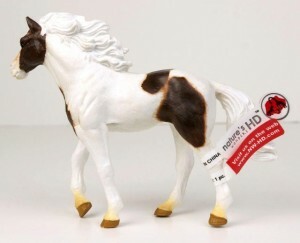 Parents who have purchased the Nature Wonders HD Pinto Horse from Blip Toys are cautioned to immediately remove the toys from their children. Blip is offering free replacement toys to parents who contact them regarding the recall. Blip Toys can be reached by calling (888) 405-7696 or through their website www.bliptoys.com/recall.